Some years ago, author Michael J. Sullivan began writing a fantasy for his daughter: a story that she would enjoy hearing, but also one that he would enjoy reading. 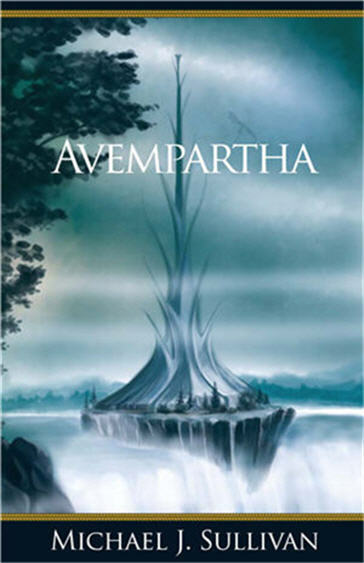 It eventually turned into a six-book epic fantasy series that was published through an independent press. What was perhaps most unique about the Riyria Revelations was that Sullivan had all six books completely plotted and planned to serve as individual, stand-alone novels, but also linked together into a long series. 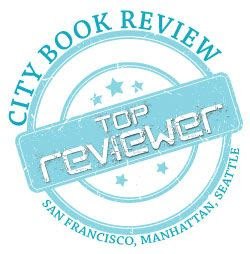 The series slowly but surely gained momentum and a following, as more readers and fans were discovered, and the books received more ratings and reviews on the likes of Good Reads and Amazon, and Sullivan received more and more interview requests, including with yours truly. His popularity and success grew to such a point that after the release of the fifth book in the series, Sullivan finally got that big publishing contract with Orbit Books, who released the series in three volumes late last year and early this year, with two books in each volume. This is the story of two thieves who change and grow and develop through each of the six books, as readers become so attached to them that by the end they feel like family. It is also the story of what heritage and history means, and that the past is never truly gone, but also that sometimes these things don’t have to matter as much as people think they do, and it’s important to enjoy life however you can. 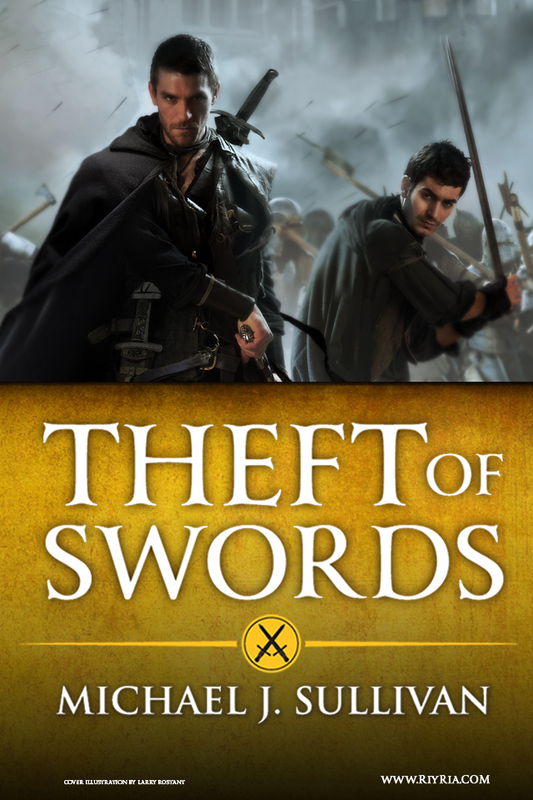 Theft of Swords: In The Crown Conspiracy our main characters are nothing but low-life thieves: Royce Melborn and Hadrian Blackwater, although they’re very good at their jobs. The story begins with the introduction of these intrepid characters and their next heist to steal a particular item within the impenetrable confines of the king’s castle. But as soon as they have their hands on the item, the trap is sprung, and they find themselves part of an elaborate plot. At their feet lies the lifeless body of the king. From here, the story kicks into high-gear, taking the reader on a wild ride. In this world it is important to know who your friends are and who are your enemies; it is also important to keep your enemies closest. As the story unfolds, we learn that while they may be common thieves, they are very smart people. They also realize that the idea of being a good person is starting to rub off on them, as they no longer do anything for a fast buck. By the end of the book, everything seems to have sorted itself out. Royce and Hadrian are now doing very well for themselves, as well as being close friends of the king. But clearly all is not as it should, since this is the first book in the series. In Avempartha, our intrepid duo returns in the second installment of The Riyria Revelations to solve another mystery and fight another day. Before Royce and Hadrian barely have time to settle after the fun had in The Crown Conspiracy, they find themselves pulled into a new problem: a young woman needs their help as her village is being attacked by an unknown nocturnal creature. The town of Dahlgren is an idyllic place, except now it is visited each night by an ancient monster looking to terrorize and kill everyone. Royce and Hadrian know they can’t take on this beast by themselves, at least not without some impressive magic, and call on the help of their old friend and brilliant wizard, Esrahaddon. Hadrian does his best to protect the town and its people, fortifying it, and having everyone hide out in the fortress each night. Meanwhile Royce and Esrahaddon journey to the ancient elven tower known as Avempartha. There they hope to confront the beast and kill it. But everything doesn’t go according to plan, as it never does, and Hadrian learns some very important things about himself. Rise of Empire: In Nyphron Rising, things take a turn for the worse as war comes sweeping through to Melengar and its people have little hope and respect for their recent, young king. Princess Arista has been running around playing diplomat and trying to secure allies for Melengar, with nothing to show for it. Meanwhile the enemy Nyphron Empire continues to grow in strength and numbers. Arista has one more trick up her sleeve, and with the help of her good friends, Royce and Hadrian, goes on this last journey far south in a last effort to secure an ally, but also to unravel a mystery of Hadrian’s past. Surprising results are revealed about our unknown thief that ties into the whole story of the Riyria Revelations. The wizard Esrahaddon continues to be up to no good, while we learn more of the enigmatic man known as Degan Gaunt. Sullivan does a great job with Nyphron Rising, after setting necessary groundwork and story and setting with the first two books, he opens it up on an epic scale, traveling his invented world, and educating readers on how future events are going to affect everyone across Elan, and why the forgotten history is important. Royce and Hadrian continue to be the entertaining and interesting characters that they are, while Arista opens up her emotional side. With the events of Nyphron Rising now at a close, the elusive duo, Royce and Hadrian aren’t sure what do to next. Royce has plans to retire and relax, settle down with his lady love and enjoy the rest of his days, while Hadrian has dark shadows of his past and heritage to confront and accept, while deciding he is on a mission to find the lost heir of Novron. It takes Royce all of three seconds and little convincing to decide that Hadrian won’t last long without him, and together the two set out, following the clues that lead them to the mighty trading vessel, the Emerald Storm. They know nothing of seamanship and what to do aboard such a large vessel, but knowing one of the crewmen, they’re able to get added to the crew and begin the journey through the mysterious and interesting lands of Elan. Naturally, there is lots of adventure on the high seas, not to mention some strange guests on the Emerald Storm, as well as the enigmatic cargo. Meanwhile an important subplot is furthered along with the princess, who is bored with her station, looking to make her life more interesting, and gets some answers. Heir of Novron: In Wintertide, on this year’s holiday of the same name, a special celebration has been planned. The New Empire wants to make a big deal of its victory over the Nationalists, and has some important public executions planned: the villainous Degan Gaunt and the Witch of Melengar. The only problem is that Royce and Hadrian are in town and they happen to be good friends with both of those people and have plans of springing them free whatever it takes. Sullivan clearly had fun with Wintertide, playing around with Hadrian engaging in a joust, even though he doesn’t know much about the whole nobility and chivalry thing, but he sure knows how to fight. And how having friends in the most unlikeliest of places often proves invaluable. Fans will enjoy this penultimate chapter, with Sullivan’s strong descriptions and scenes of the winter festivities; of the sounds, sights and smells. It’s an enjoyable, thrilling tale before the final showdown. In Percepliquis, the beginning of the end has begun: the elves of old have crossed the Nidwalden River in large numbers and are coming to take over; they threaten the entire continent of Elan. The people have little hope left; they know they don’t stand a chance against these powerful elves. And it all comes down to Novron’s heir, who must make a stand, and the only way he can do that is by finding the sacred horn. It will involve an arduous quest, with a strong group of warriors who also possess intellect. They will have to travel deep beneath the ground, in search of the ancient, ruined city of Percepliquis, following an old diary that may not even be true. Fortunately, Royce and Hadrian are coming along for the ride, so if these intrepid few have any chance of finding the horn and saving the people of Elan, only these two will be able to make it happen. In the longest volume yet, Sullivan has outdone himself here with lots going on: multiple storylines, lots of action, lots of conflict between friends and enemies, important details from the previous books brought to light, travels through various terrains, and an ultimate duel. With the thrill of a top-rate action movie, combined with the epic grandeur of Tolkien’s Return of the King, this is a final showdown you won’t be able to stop reading, let alone put down. Who will live; who will die? In this grand finale, anything can happen . .. you won’t want to miss it. Originally published on Forces of Geek. Some years ago, author Michael J. Sullivan began writing a fantasy for his daughter: a story that she would enjoy hearing, but also one that he would enjoy reading. It eventually turned into a six-book epic fantasy series that was published through an independent press. The series slowly but surely gained momentum and a following, as more readers and fans were discovered, and the books received more ratings and reviews on the likes of Good Reads and Amazon, and Sullivan received more and more interview requests, including with yours truly. His popularity and success grew to such a point that after the release of the fifth book in the series, Sullivan finally got that big publishing contract with Orbit Books, who released the series in three volumes late last year and early this year, with two books in each volume. 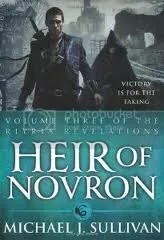 The final collected volume of the Riyria Revelations, Heir of Novron, is now available and the really cool thing about is that it’s probably the best volume, bringing together the two best books of the series: Wintertide and Percepliquis. What’s also interesting is how each book is quite different from the other, one might even say they’re diametrically opposed in some ways: the former is a shorter, smaller, concise story that deals more with intrigue and knowing who you know and being in the right place at the right time, as well as focusing on one town and the enchanting celebration of a winter holiday; the latter is an epic fantasy tale that many have come to enjoy with the genre, featuring a grand quest, a band of important characters, and important events that will change the world of Elan and its people. In Wintertide, on this year’s holiday of the same name, a special celebration has been planned. The New Empire wants to make a big deal of its victory over the Nationalists, and has some important public executions planned: the villainous Degan Gaunt and the Witch of Melengar. The only problem is that Royce and Hadrian are in town and they happen to be good friends with both of those people and have plans of springing them free whatever it takes. Originally written on February 11, 2012 ©Alex C. Telander. 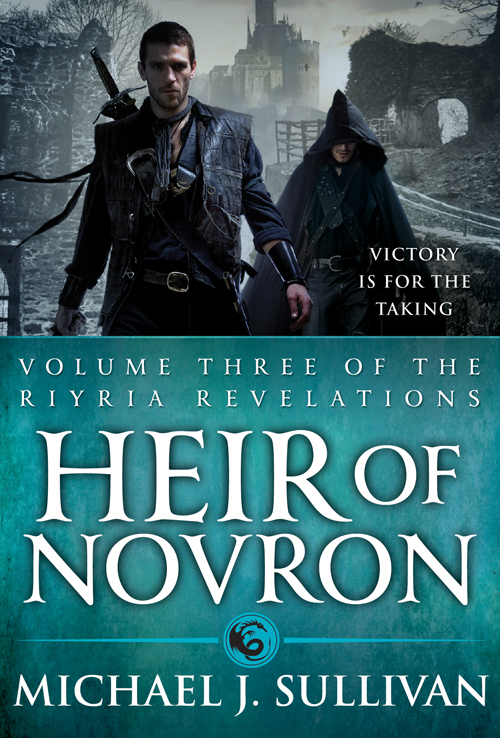 To purchase a copy of The Heir of Novron from Amazon, and help support BookBanter, click HERE. This moment has been subtly building for the last five books, and now it is finally here. When Michael J. Sullivan set out to write the five-book series of the Riyria Revelations, his goal wasn’t to write an intrinsically-linked series of books, nor was it to write five stand-alone fantasy novels; it was to do a combination of the two. Readers can enjoy each of these books in their own right, as the entertaining stories that they are, but at the same time there are sub-plot and elements embedded in there, building a comprehensive story that comes to a climax in this final volume, Percepliquis. The beginning of the end has begun: the elves of old have crossed the Nidwalden River in large numbers and are coming to take over; they threaten the entire continent of Elan. The people have little hope left; they know they don’t stand a chance against these powerful elves. And it all comes down to Novron’s heir, who must make a stand, and the only way he can do that is by finding the sacred horn. It will involve an arduous quest, with a strong group of warriors who also possess intellect. They will have to travel deep beneath the ground, in search of the ancient, ruined city of Percepliquis, following an old diary that may not even be true. Fortunately, Royce and Hadrian are coming along for the ride, so if these intrepid few have any chance of finding the horn and saving the people of Elan, only these two will be able to make it happen. Originally written on February 6, 2012 ©Alex C. Telander. To purchase a copy of Percepliquis from Amazon, and help support BookBanter, click HERE. In the fifth and penultimate volume of Michael J. Sullivan’s Riyria Revelations, he once again manages to play off a familiar fantasy storyline, in this case the art of the joust and power of the nobility within a city, and with his unique cast of characters, makes Wintertide feel completely original. While readers of the series may be familiar with Royce and Hadrian, it’s the adventures they get up to in this book that really make it worthwhile, with an ending that sets up for a grand finale in the final book of the series. Wintertide is the quiet before the storm. On this year’s holiday of the same name, a special celebration has been planned. The New Empire wants to make a big deal of its victory over the Nationalists, and has some important public executions planned: the villainous Degan Gaunt and the Witch of Melengar. The only problem is that Royce and Hadrian are in town and they happen to be good friends with both of those people and have plans of springing them free whatever it takes. Originally written on February 8, 2012 ©Alex C. Telander. 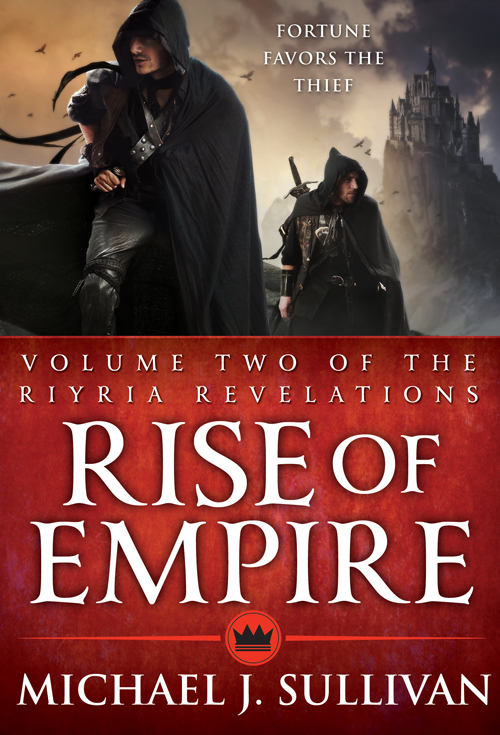 Michael J. Sullivan is the author of the epic six-book fantasy series, The Riyria Revelations. Originally published with a small press, the series was picked up this year by Orbit books and is being released in three volumes. The first, Theft of Swords, released in November, contains the first two volumes. The second, Rise of Empire, features the third and fourth volumes and came out this month. The final volume, Heir of Novron, collecting the final two volumes of the series, is due out in January 2012. This is the fifth of five posts that Michael J. Sullivan will be doing this week on BookBanter. Check back tomorrow for the next post, or you can subscribe to the BookBanter Blog by entering your email at the top right of the BookBanter Blog page. Listen to an interview between BookBanter and Michael J. Sullivan. I feel fortunate that I can count myself as one of the minority that does indeed support my family through my writing. For years my wife was the sole bread winner, allowing me to tap away at the keyboard without the added distraction of a nine-to-five job. I was pleased when we had enough saved up so that in April 2011 she was able to leave that behind. One thing that I should mention is that non-fiction writing is generally easier (more books produced, higher pay, easier to find a publisher) but I’m going to limit my discussion here to novels. So, let’s say you want a shot at writing novels fulltime for a living…what would I recommend? Well let’s break it down. Series are very common in romance, fantasy, science fiction, and mystery/thrillers genres. Usually they follow a particular character (or set of characters) and provide repeat buyers a familiar experience to dive back into. Writing series is a key to financial security as you don’t have to rebuild a fan base from scratch with each new book. Also, series have longer legs, in other words the sales of the first book (and those in between) will receive a boost each time the next book in the series comes out. I have some pet peeves about series writing. First I hate a true cliff hanger where you need to read the next book in order to obtain closure on the book you just read. To me this is a cheap trick to get another sale. You need to ensure that each book has its own conflict and resolution. That’s not to say you can’t have hints or tease of an ongoing mystery, just make sure that your books contain a complete episode. Sometimes books break at unnatural places because they are too long to publish as a single work. This happens often in fantasy and again is another pet peeve of mine. If you are going to write series, I recommend you design your breaks from the beginning…no one likes to be stopped in the middle of the story and your goal is to make a reader want to read your next book not force them into anther purchase. Few authors will be able to support themselves with a single book. Most won’t be able to even with two or three (unless they are wildly popular). You must produce a body of work and you need to constantly keep your fans well fed. Putting out multiple books in a single year is most often accomplished by self-published authors and some of the most successful ones have released six or more books in a single year. This generally is not a pace that can be maintained, and I’m not saying that you have to do that. But if you are able to produce at least two books a year, then you’ll probably be in pretty good shape. The infrastructure of traditional publishing sometimes struggles with prolific writers. Generally there are release calendars, which are basically windows when books are scheduled, and some finished books may take up to two years to hit the street. Even my books, which were finished and fast-tracked took a year to come out (the Fall 2011 was the next release calendar available) but I was fortunate that Orbit released all the books in subsequent months: Theft of Swords (Nov), Rise of Empire (Dec), and Heir of Novron (Jan). My contract has a period of non-compete…a time of exclusivity when only the Orbit books are available for sale. So I’ve been hard at work writing my next books so they will be ready once the period expires. In some respects I should have led with this, but I consider this as a “given.” In real estate it’s all about location, and when it comes to publishing, it’s all about word-of-mouth sales. No book can become a success without readers falling in love with it and recommending it to others. Authors today are fortunate in that there are many more ways for people to share their excitement about a book. There are thousands of book blogs, and sites such as goodreads, Shelfari, and Library Thing where millions of people are discussing books. Most writers abhor the thought of self-promotion. Many think that this is a task relegated only to self-published authors and being published traditionally means you don’t have to dirty your feet with such activities. This is a huge fallacy. ALL authors need to promote their books. If you are self-published you wear all the hats, so of course marketing is one of the pieces you’ll have to tackle, but many traditionally published authors complain about lack of marketing support. The truth is that there is a pecking order in publishing, with best-selling authors at the top. Those near the bottom (midlist or new authors) may receive little marketing support. Most will only be included in a catalog that is sent to libraries and chain store book buyers. Projects that are deemed as having a higher potential of success will get more attention: print ads, online ads, co-op dollars for premium placement in bookstores, and so on. These activities are all fine and well, but even if you receive such attention you shouldn’t feel that it is “good enough.” Keep in mind that all marketing departments are spinning plates of multiple titles at once. You…and only you…will be 100% dedicated to your titles, and the more messages about your book(s), the better the chances that they will get noticed. As mentioned above, word-of-mouth is king but you have to prime the pump and get enough people to know it exists before the self-perpetuation of one person telling another will kick in. I’ve received a significant amount of income from the sales of foreign rights. I’ve signed contracts for: Czech Republic, Poland, Russia, France, Denmark, Germany, Spain, Brazil, and Japan. Although I had a higher than average US advance (six-figures instead of four-figures) I’ve made about double that through the sales of foreign rights. Whether this is additional income, or goes to paying off your advance, depends on your contract and I’ll discuss this more in a minute. While generally not huge (in terms of initial income), I’ve also received additional monies because Orbit has licensed the books for a hardcover book club edition as well as an audio version. I look upon these formats as a way of spreading the word. The income potential is not that high, but it does provide another way for people to discover that I exist, and besides, every little bit helps. Most authors will never earn out their advances, which basically means the advance will be the only compensation they will ever receive for a book. The statistics I’ve seen is only about 10%-20% will do so. For those that don’t understand what earning out is, let me explain. Larger publishers pay advances for books. This is a sum of money that flows to the author before even a single book is sold. It can, in many ways be thought of as a loan. As books sell, royalties are earned (the author makes from $0.40 to $2.50 a book depending on format and price) but this money initially stays with the publisher because it is repaying the loan. Only if enough books sell, and the full loan is repaid, will the author will receive additional money. It’s not only sales of individual books that can work toward “paying back the loan”. Any rights sold by the publisher as a subsidiary right (such as foreign sales, book clubs, or audio book contracts) will have a percentage of that sale going to the author, and that will be applied against the advance. I have an author friend who was really happy because their contract was written with worldwide rights, and they received enough foreign sales to get them very close to earning out. Personally, I think they would have been much better off if they had sold only English language rights as that additional money would have gone directly to them and essentially doubled their initial income from the books. Earning out means you’ll have ongoing revenue (although it usually comes only once or twice a year – so you need to manage your cash flow carefully). Without it, you’ll have to ensure that contract income (from foreign rights and new books) will be enough to keep the bills paid. Without earning out you are basically treading water…consuming the income for each book as they are created. Having books earned out can help break that cycle and allow you a bit of breathing room. Writing for a living can be very hit and miss and trying to determine when money will come in is almost impossible. What if the book is bumped in the release calendar? That 1/3 of the advance upon publication will be delayed. What if sales of a first book are too low and the publisher cancels the other books in a multiple book deal? Well you just lost a ton of cash. What if you earned out, but then sales decline? That ongoing stream is not so ongoing. What if none of the foreign publishers are interested? That’s a whole huge potential that is gone. You could easily have a six-figure salary one year and nothing the next. My approach is to count no chickens before they hatch. I make sure I always have at least one year’s worth of income stashed away and am always thinking about the date of my next book as that is the next chance for additional income. I manage my spending…in other words I’m not extravagant in my purchases…as I feel more comfortable banking money for the potential lean times ahead. The most important take away from this post is to manage your expectations. Writing novels is not a “get rich quick” career. Sure, there are some who make millions at it…but those are few and far between. The bulk of “paid novelists” earn only a few thousand a year. Even if you are fortunate enough to earn a good sum of money, you need to realize that there is no guarantee about any future income, so the strategy of the ant is far better than that of the grasshopper. This is the fourth of five posts that Michael J. Sullivan will be doing this week on BookBanter. Check back tomorrow for the next post, or you can subscribe to the BookBanter Blog by entering your email at the top right of the BookBanter Blog page. Hello once again…I’m back to discuss another topic that Alex asked me to write on. This time it involves different ways of going about getting your books to market. I’m a bit unique in that my Riyria Revelations have been published just about every way possible: small-press (Aspirations Media, Inc), self-published (through a company created by my wife, Ridan Publishing), and big-six traditionally published (Orbit, fantasy imprint of Hachette Book Group). The publishing world is going through major changes…perhaps the largest since the introduction of the Guttenberg press…and the old rules may no longer apply. If you are an aspiring author, you are probably familiar with the standard path to publishing. If a match is found, and there is availability in the publishing calendar, an offer is made. With the recent popularity of ebooks many authors, myself included, have found an audience and made a good income by self-publishing their works. The ability to successfully self-publish is a relatively new phenomenon. It was in November 2010 that “the freshman class” of self-published authors really saw their books take off. I was joined by authors such as Amanda Hocking, Joe Konrath, John Locke, David Dalglish, H.P. Mallory and dozens of others who sold tens of thousands of books (and in some cases hundreds of thousands) in a single month. The difference is that ebook distribution networks now provide self-published authors access to readers that had been previously unavailable when books were predominantly sold through bookstores. Publishers and agents started to take notice of independent authors whose books climbed up the Amazon charts and reached bestseller status. The dynamics were set on their head and many agents started signing self-published authors and used their sales figures in proposals to the publishers, which landed contracts. For those that have been in the industry for a long time, you may have heard that once the first publication rights of a work have been exercised, no publisher would be interested in re-publishing the work. This was true at one time, but it is no longer the case. In fact, I wouldn’t be surprised that in the not too distant future, some of the slush pile moves from submitted queries, to reading books that have been self-published. So, what’s a new author to do if your goal is a contract with a big-six publisher? The answer is…it depends. Self-publishing requires you to wear many hats not the least of which is becoming savvy at marketing so that your books get noticed. Some people may not be suited to this very entrepreneur path, and so they should continue to query. But I also suggest that they simultaneously work on building a platform with social media, as this is an increasingly important part of the total author package. If you do feel you have what it takes to “be your own boss” and take responsibility for all aspects of producing your book, then self-publishing will probably be a great way to prove the work is worthy of consideration. In general the numbers I’ve heard is that if you can sell 5,000 books over the course of a year both agent and publishers will take notice. Going this route can also significantly decrease the long review time that usually accompanies the standard query process. When my foreign rights agent approached several New York publishers about taking over my series, I thought it would take years before we got any nibbles. As it turned out there were seven or eight companies who expressed an immediate interest and I decided on a publisher and agreed to contract terms in about three-weeks from the date of first contact. I also received a higher than average advance than most debut authors. After all, I was already making six-figures from the series on my own, so the publisher needed to take that into consideration when trying to attract me into signing. So, which route is best? The truth is that both paths are generally difficult. I have a theory that the number of self-published success stories is essentially equal to the number of manuscripts selected from slush piles and successfully brought to market, and in both cases there are thousands of failures for each success. However there is reason for optimism, as now there are choices, one of which puts the control more firmly in the hands of the author themselves. No one can accurately predict which books will take off and which will fail to find an audience. But for those who successfully self-publish, and desire a contract with a traditional publisher, then bypassing the query process just might be the fastest path to your goal.